Boasting a vast array of facilities as well as a fantastic location on the seafront, the Blue Bay Deluxe Complex Rhodes Waterpark is the perfect family holiday resort for those looking for a carefree, fun filled holiday. 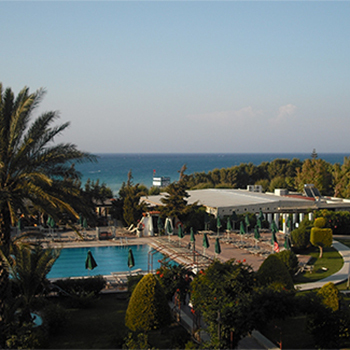 Guest here also have access to the Aquapark, which has 4 swimming pools and various slides. Travelled with friends to the Blue Bay Hotel, we were all a bit apprehensive before we arrived as some of the reviews were not great, however we had a fantastic time. The rooms were clean, maid service 6/7 days, food was of excellent quality if not much choice. Entertainment team were good and friendly throughout. The only down side was the All Inclusive drinks had to be collected from the pool bar even at night as the hotel main bar was chargeable. Overall though very good.